Over the last several decades Australia has developed a particularly vibrant specialty coffee scene. Cities seethe with cafés and café-goers. No consumer coffee events I’ve ever witnessed elsewhere have come close to the energy and sheer scale of Australian coffee festivals. And coffee in Australia continues to be appealingly local, as independent cafés considerably outnumber chain locations in most neighborhoods. Until recently, however, Australia has unequivocally been espresso country — usually espresso taken with milk, though with more emphasis on cappuccino and classic milk drinks and less on the syrups and frou-frou variations that cluttered American espresso menus up until a few years ago. Recently, however, I’m told that single-origin coffees intended for drip brewing have become at least a bit more important on the Australian scene. So, when my co-founder and colleague Ron Walters offered to bring back some coffee from Australia for a tasting report, we decided to focus on coffees intended for “brewed” application, meaning drip, filter drip, French press, etc. Ron brought back 21 coffees from 10 independent Australian specialty roasters, all from southeastern Australia (New South Wales, Victoria and Tasmania). All samples were whole-bean, protected by the same kind of packaging standard with smaller American roasters (sealed immediately after roasting in moisture- and atmosphere-resistant laminated foil bags with embedded one-way valves to allow CO2 to exit without allowing staling oxygen to re-enter). So what did we find out about single-origin drip coffees from Australian roasters, viewed from an American perspective? Of course, 21 samples from 10 roasters is a tiny cross-section of a vibrant industry segment, so you will find no generalizations here. But we can describe what appeared on the cupping table and add an observation or two. Overall, we tasted a set of very engaging green coffees, skillfully roasted. True, we ran into a couple of samples (not reviewed here) consisting of uneven, mildly tainted green coffees, about the same percentage as might turn up in a similar sampling from small American specialty roasters. Well, no, not quite. Perhaps the Australians by percentage did very slightly better than we might expect from a similar cross-section of American roasters. Origin and green coffee type. Despite the quality of the coffees, we found a bit less range and excitement than a romantic coffee drinker hoping to travel the world by cup might wish for. We tasted several Colombias, some outstanding Kenyas and Ethiopias, and a sprinkling of others: Tanzania, Central America, Brazil. However, most samples were conventionally washed coffees from familiar tree varieties. We found relatively little in the way of coffees that offered unorthodox or surprising profiles achieved through unconventional processing method (honey, Indonesia wet-hulled, whole-crop natural) or exotic tree varieties. It appears from this set of samples that a classic, purist expectation for balanced structure and cleanly expressed complexity dominated among these ten Australian roasters. It was also surprising not to find more Pacific and Asian origins on the single-origin coffee menus of these ten roasters. One Thai coffee on one website was about it. No Indonesias, and no Papua New Guineas, despite the geographical proximity and close historical ties between Papua New Guinea and Australia. And no Australia coffees, though given the very small coffee volumes produced in Australia and the tendency for Australian growers to roast and retail their own coffees, this omission comes as no surprise. Roast: no dark-roasting here, that’s for sure, but almost no medium-roasting either. Most samples were In most cases, a light roast executed tactfully and skillfully, though on occasion we felt that the roast may have been a bit too light to fully develop the coffee’s potential. We review 8 here of the total of 21 samples we tested, with ratings for those 8 running from 91 to a high of 94. The roasters of the four top-rated coffees — Campos, Mecca, Ritual, and Axil — all had second samples that also scored well, but we followed our usual practice of reviewing only one sample — the highest rated — from any given roaster. The top-rated Campos Coffee Ethiopia Yirgacheffe Goro (reviewed here at 94) offered a fine medium-roasted variation on the classic washed Yirgacheffe cup. Less citrus than usual, but the flowers were particularly complex in range and spicy in character, the underlying chocolate solid, and the acidity juicy. Mecca Coffee roasted the highest-rated of four excellent Kenyas. Its Kamwangi Factory Kenya Kirinyaga (reviewed here at 93) was sweetly but intensely bright, animated by the brisk, elegant dry fruit character (often labeled black currant) typical of fine Kenyas. 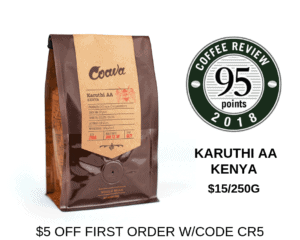 A nicely modulated light roast developed the complex, rather exotic profile (plush flowers, pungent, mango-like fruit, chocolate fudge) of Tasmanian roaster Ritual Coffee’s Colombia Miranda (reviewed here at 93), the highest rated of the five Colombias we tested. The San Ysidro Costa Rica from Victoria’s Axil Coffee Roasters (reviewed here at 93) was one of the few samples that was apparently processed by an alternative method, probably what Costa Ricans call yellow honey, in which the fruit skin and a portion of the fruit flesh is removed immediately after harvesting, but some of the fruit flesh is allowed to dry on the beans. This processing and a tactful light roast netted a lush but cleanly expressed profile, richly floral with a crisp backbone of aromatic wood. Reviews for four more excellent Australian-roasted coffees rated 91 to 92 also appear this month. If this set of coffees overall is typical of current Australian single-origin small-lot offerings for non-espresso brewing, then Australian coffee-lovers venturing beyond the portafilter appear to be well-served. Stu Grant of Ritual Coffee, whose Colombia Miranda is reviewed here at 93, sent us the following thoughtful email response to a question about the place of single-origin “filter” coffees in the Australian coffee scene. I thought I might close by quoting it in its entirety.